I’ve become desensitized to the war on young black men and that’s a problem. How many police shootings have happened over the past 3 years that led to any kind of indictment? I can’t name one! I just accept it as fact and go back to living in my silo. I’ll sip a chai latte and nibble on a croissant at the Starbucks in Harbor East while making lofty observations and generalizations about being Black in America, but how is that helping anybody? I’m so caught up in my day-to-day–grad school and a demanding j.o.b.– that I don’t have time to add activist to my list. It sounds cold and indifferent doesn’t it? But it’s true, there’s never a convenient time to take a stand, to demonstrate, to fight for equality. Then I heard about Freddie Gray. I watched the video of him being dragged into a police vehicle alive, holding his neck up. Next thing the public knows, he has a broken neck, is in a coma and then dies. To say I was appalled is putting it lightly; I was enraged. There’s so much gun violence I’ve become desensitized to it, but his broken neck and subsequent death were like a bucket of ice water to the face. Even so, did I do anything about it? No. Fast forward to this past Saturday. I was at the library working on a final project for one of my classes. I rolled out around 2:30 to rush home before I got hung up in traffic because of the demonstrations. I made my way home, fired up the ol’ laptop and began working. Sitting cross-legged on my bed with the window cracked I began to hear chanting. As I looked out on to Pennsylvania Ave a diverse crowd of protestors marched by waving homemade banners and posters for Freddie Gray, chanting: “Hands Up, Don’t Shoot! Hands Up, Don’t Shoot!” It was like the call of the wild. I was compelled off my bed into the streets. I followed that chant like the Pied Piper. My significant other and I joined the crowd at Pennsylvania and Franklin and ended up walking all the way down to Pratt Street, stopping off at Camden Yards and then landing at City Hall. Being in the middle of that crowd felt like community. We were all one walking these Baltimore streets; it felt good. I didn’t chant though. I didn’t raise my fist to the sky. I walked quietly. I went inward. When did I douse my black female voice in the struggle? When did I start being so ‘agreeable’? Ahhh that’s right, I spend 45 hours a week in an environment where I’m supposed to be p.c. I find that my patience flags when I talk to white people–who have not grown up in this predominately black city or who haven’t had much personal experience with black people–about my experiences as a black female. Their eyes tend to glaze over like ‘here she goes.’ Then I feel bad about being irritated and I just don’t say anything. But I don’t want to be rubber-stamped ‘the angry black woman’ or have eyes roll when I bring up yet another story about race matters. I don’t want to hear someone say ‘come on, slavery was so long ago, you can’t blame that!’ The historical impact of slavery has been watered down, folks are actually saying that we live in a post-racial society. Get outta here! Not possible. Yeah, I know, Obama is president but that act did not single handedly wipe out racial injustice. Freddie Gray’s mystery death in police custody is unsettling. 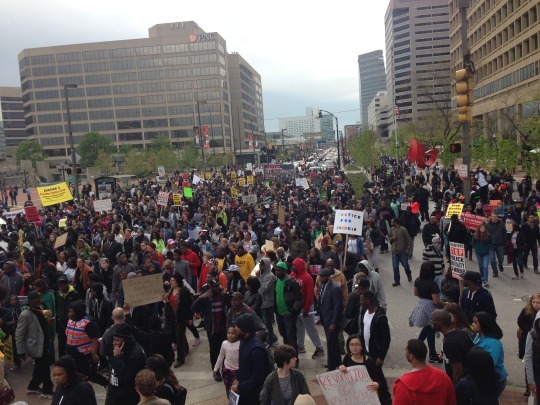 To borrow and flip Rankine’s term, Freddie Gray’s death is a macroaggression and representative of a horrific trend. So if you want to say something like “We should wait before we judge these police officers’ make sure you say the same thing regarding our young black men. Check out a book review for “Citizen: An American Lyric”. The cover is a timely statement: a stark white background with the image of a vacant grey hoody.